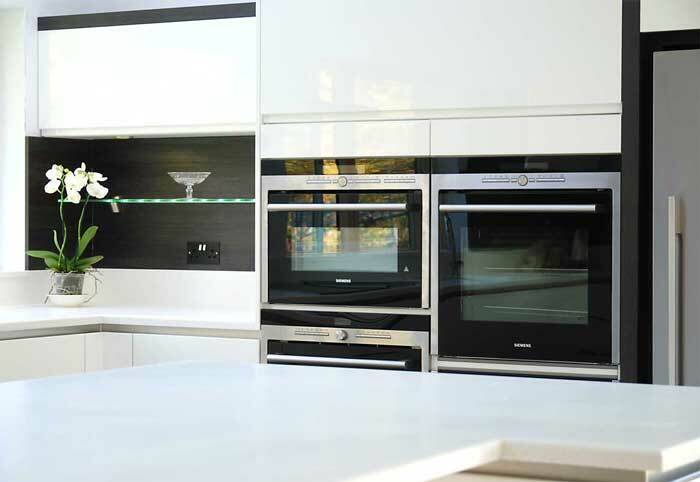 The aim here was to create a kitchen that worked not only as a great family space but just as importantly the kitchen had to deliver a very high level of functionality for some pretty serious cooking. Sitting within the open plan living space it needed to be somewhere the whole family could spend time together, children, grandchildren, two dogs and very occasionally the odd lamb! 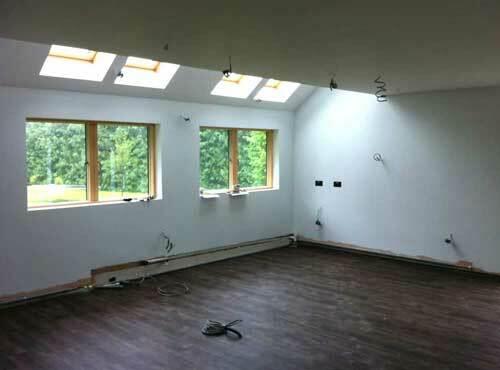 With this in mind the island was to be kept clear of any appliances, to ensure it was a child safe zone, there needed to be seating for at least 4 adults and ample preparation space. 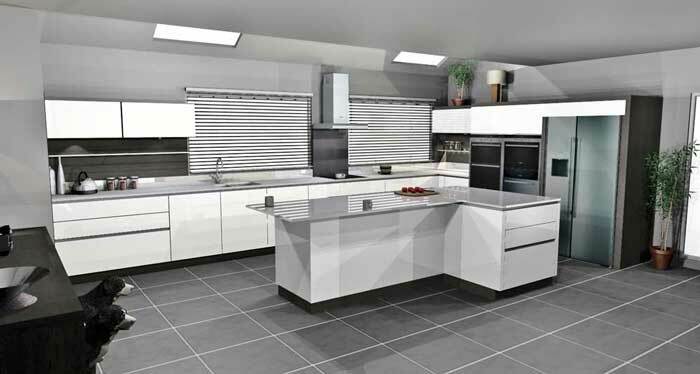 Whilst being sizeable, the kitchen had to sit within the space so as not to interfere with family life, big parties, table tennis and even the odd disco. The L shaped island forms the centre piece around which the kitchen flows, with a large oven bank sitting alongside the fridge/ freezer. 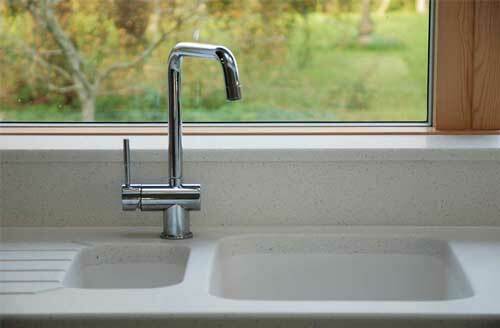 The sink and hob positioned on the long wall so as to be out of the way when young children are about. 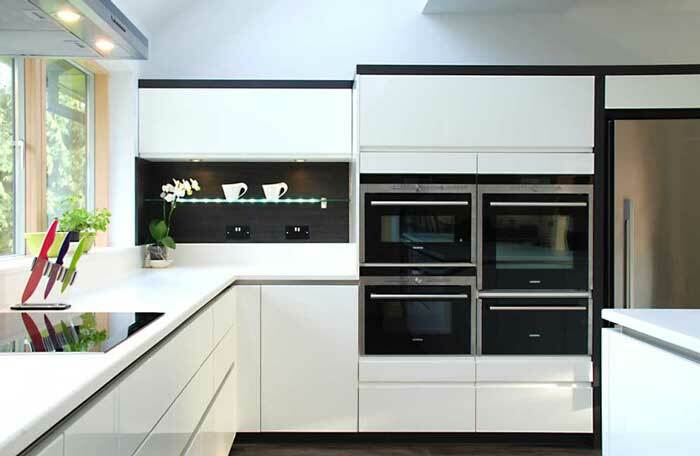 The freestanding fridge freezer, with ice and water, was to appear to be built in, sitting within framing, coordinated to match other detailing within the kitchen. To provide the ultimate in functionality a great deal of time was spent configuring the drawers and cupboards to provide exactly the storage our client wanted. 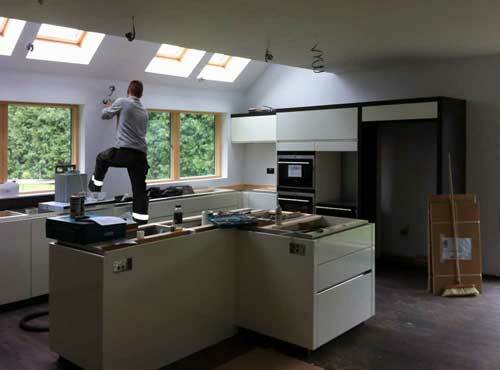 For example, a special unit with a lifting platform for the food mixer were incorporated into the island to allow the appliance to be hidden away whilst at the same time being easily accessible for those big baking sessions. A bank of 3 Siemens IQ7000 ovens and a large warming drawer ensured once mixed, the cakes would never be short of an oven to hide in. 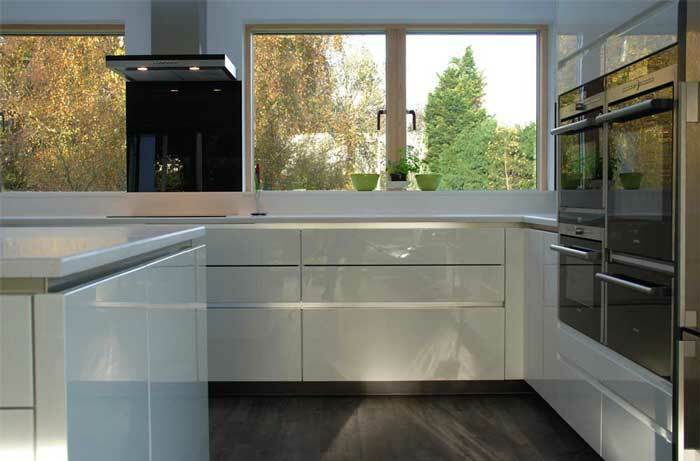 The simple white, handless cabinetry was to be finished off with composite worktops, an integrated sink, 100mm up-stands and feature wall panelling with led illuminated shelves. The overall effect of this kitchen is exactly the light, open space our client was looking for, with both serious cooking and serious fun the order of the day. The quality of the furniture underpins the functionality with some simple but effective lighting details really elevating the space to another level. The Terra Oak framing and panelling, the LED’s not to mention the vast oven bank all combine to great effect. It is often the way the various elements are integrated with one another that makes the difference in the overall feeling of quality, like the heavy clunk of a BMW or Mercedes car door closing; this kitchen just feels solid. The attention to detail doesn’t stop with the cabinets and the layout. For the ultimate in functionality and design, 100mm up-stands and window boards are all seamlessly joined to the worktops to provide a completely waterproof work area. Handy if the dog needs a bath! Set within a fantastic property, tucked away in a glorious location, this kitchen certainly had a lot to live up to. Does it deliver, we think it does.